Lionel Andres Messi was born in Rosario, Argentina, on June 24, 1987. Argentine national team player plays 169 cm it currently plays in La Liga with Barcelona. At the age is still 21 years old, Messi is considered as one of the best talents of Argentina. Former legendary player and coach of the Argentine national team, Diego Maradona, saying that Messi is the successor to himself. 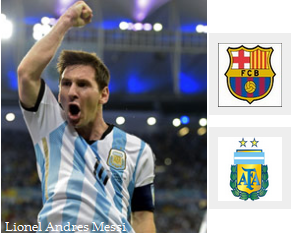 Messi himself often being compared to players who led Argentina to the 1986 World Cup. Messi started the first professional football career with Barcelona after it was joining the junior team Newell's Old Boys. Messi with Barcelona debut in the 2004-2005 season and is a record as the youngest player to play and score goals in La Liga. In his first season at Barcelona, ​​Messi helped lead Barca won La Liga, and the following season won a double of La Liga and the Champions League. In the 2006-2007 season, Messi scored a hat trick against Real Madrid in a match 'el classico' and scored 14 goals in 26 matches. In the Argentina national team, Messi won the Junior World Cup title in 2005 and in 2008 won the Olympic Games in Beijing. Together with senior Tango Team, Messi diving debut on August 17, 2005 at the age of 18 years 54 days. You're reading an article entitled Lionel Andres Messi written by Other World Cup which contains about : And I'm sorry, you are not allowed to copy and paste this article.